Tomorrow's a big day in the Old Line State. In Baltimore alone, The Preakness Stakes will run its 142nd edition. 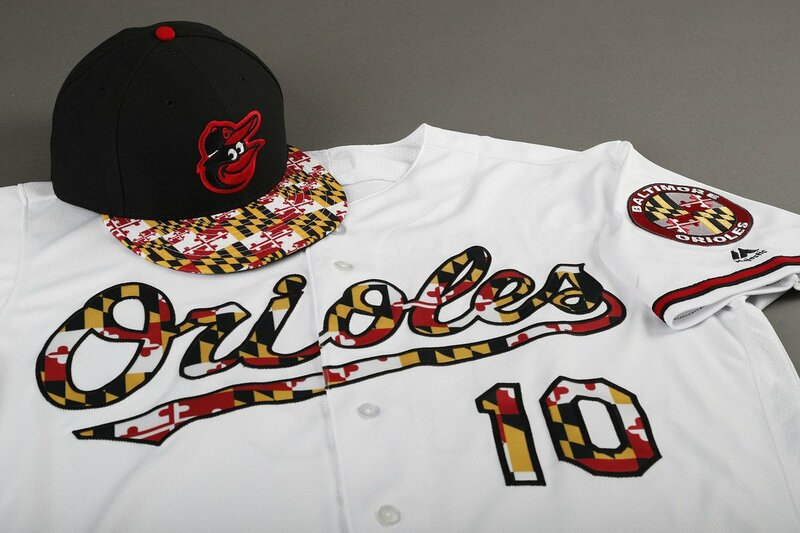 Across town, at Oriole Park at Camden Yards, the Orioles will celebrate Maryland their own way. with Maryland flag-inspired uniforms, including the iconic Calvert and Crossland patterns on the bill of their hat and on the jersey's script. This may come as a surprise to those who know I'm a Maryland flag apologist. But the reason this design annoys me is the same reason I have passed on any number of similarly patterned items in Ocean City each summer. The flag doesn't need to be tiled. Two instances each of Calvert and Crossland will suffice. Tiling makes an already busy pattern obnoxious, even to me. And by the way, O's, with another team playing just outside the state's borders and claiming DMV loyalties, don't think I don't see what you're doing as you Celebrate Maryland.